Here’s another King’s German Legion uniform spin-off, and a good example of the sort of existential nightmare we have to tackle when available primary sources are few. 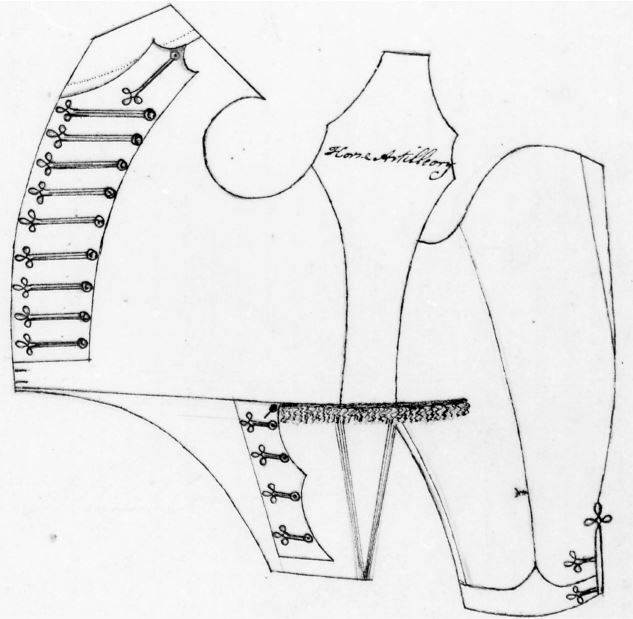 Roughly compatible with this is an image dated to March 1814, from the Elberfeld Manuscript (“Darstellung … durch Elberfeld passierten Truppen”) in the Lipperheide collection at the Kunstbibliothek Berlin – or at least, from José Maria Bueno’s re-drawing of it, as I don’t have the original handy (above centre). Plus a third primary image of an Estorff, similar but with a dark blue jacket, by Antoine Charles Horace Vernet (Carle for short) from the Royal Collection (above right); the lace should be silver or white, but otherwise it’s a fit. (For a long time, this was catalogued as the King’s German Legion 3rd Hussars, which it certainly isn’t. We’ll revisit that particular confusion in a moment …) Yes, the red/blue jacket issue is a problem, but at least we have a measure of agreement between these three. So far, so good. Now let’s see what a more celebrated eyewitness source makes of the same regiment. 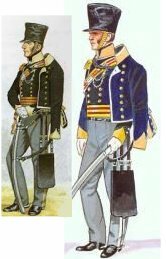 Here (below left) is the Suhr brothers’ quite different take on the Estorffs (an officer, judging by the sash) – all dark blue with yellow facings and silver lace, including a light between the overall stripes; most surprising perhaps is the cap, maybe an unrolling mirliton type or, perhaps more likely, just peakless with cords. (I’ve borrowed this image from the very useful Napoleon Online site, from the copy at the Kunstbibliothek Berlin.) This startling difference requires modern commentators to posit two quite separate Estorff uniform styles – the “early” uniform as in Suhr and the “later” uniform as in von Röder, Elberfeld and Vernet. 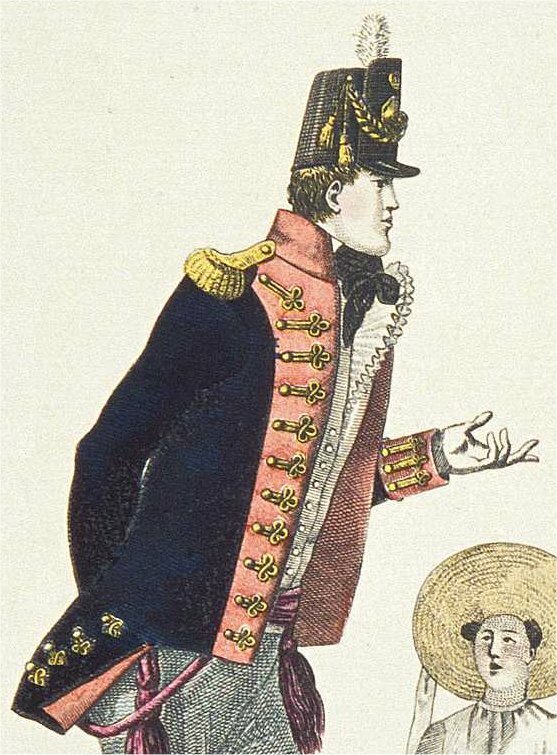 Or, as Achard and Bueno suggest in their edition of Suhr: “Possibly, we have here one of the first uniforms of the regiment, which had to wear garments and equipment from various regiments, before the regulation uniform was created.” Well, yes, possibly. And then again, possibly not. 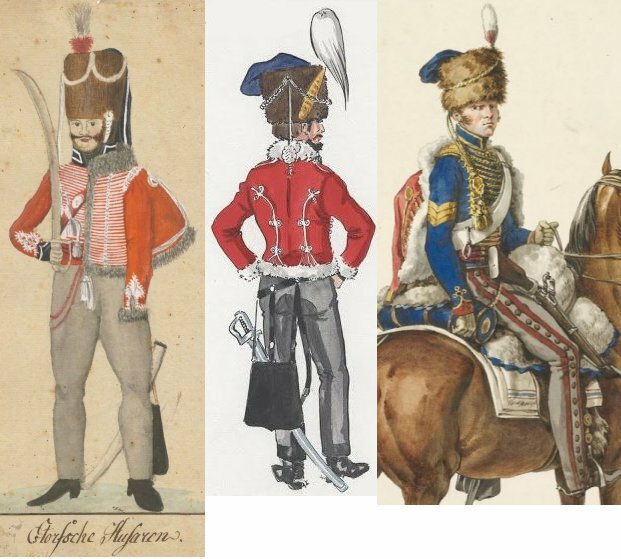 Move on a century or so, and we have a plate on the Estorff/Lüneburg Hussars (above right) from the watercolours by Friedrich Neumann known as “Landwehr und Freiwillige Truppen”, also in the Lipperheide collection at Berlin. (Borrowed from Napoleon Online again.) Apparently a private, but broadly similar, despite the grey overalls and the very different headgear and horse furniture. In fact the pose of the figure, and even the background foliage and fencing, seem so similar to Suhr that the derivation is obvious. But wait a minute – haven’t we seen this figure somewhere else? Those overalls, the sheepskin with the yellow scalloped edge, other smaller details – yes, it’s Charles Hamilton Smith’s 3rd Hussar of the King’s German Legion (above centre)! 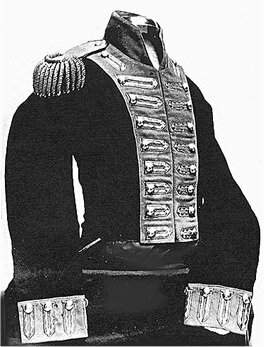 Neumann has borrowed it directly, but curiously, has replaced Suhr’s peakless cap and Hamilton Smith’s dragoon cap with the peaked fur cap associated with the 2nd and 3rd KGL Hussars. What’s going on? Though Neumann’s work is sometimes mentioned today with reverence, something has clearly gone adrift here. 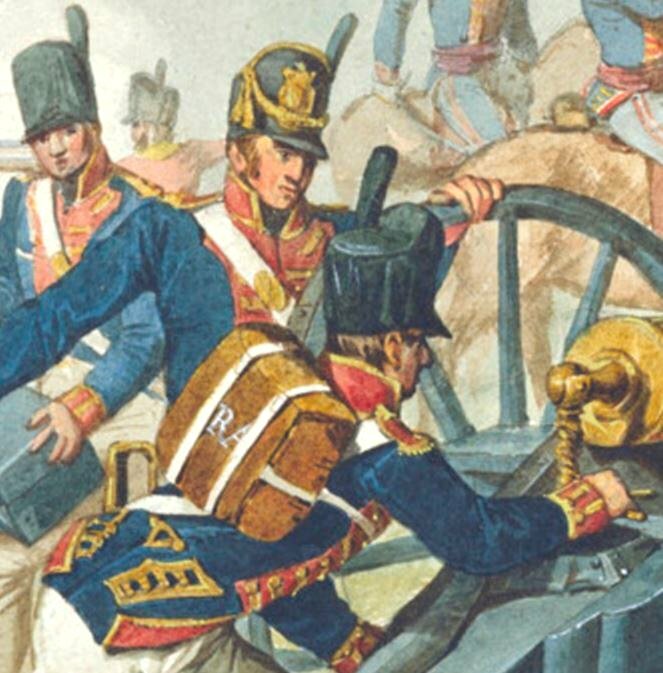 As a possible solution to the puzzle, I’d suggest that both Suhr’s and Neumann’s figures in fact portray, with more or less accuracy, the 3rd Hussars, who after all were brigaded with the Estorffs/Lüneburgs at the time; either Suhr’s original identification was mistaken, or else at some point along the centuries both attributions have slipped. 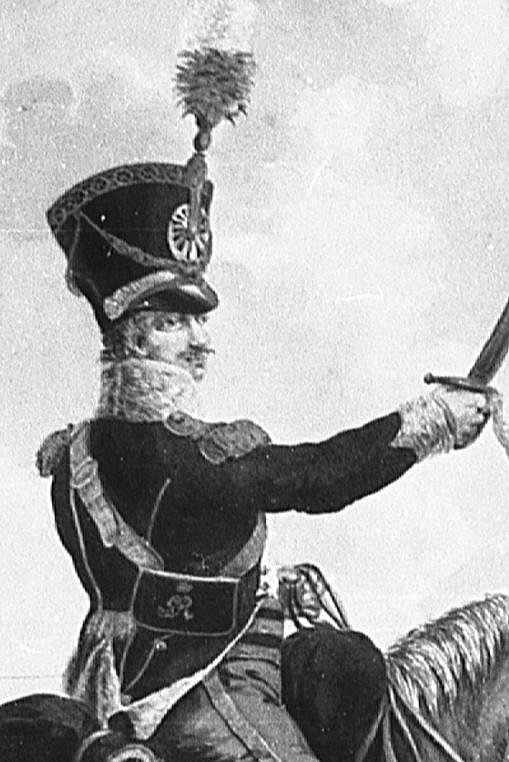 In support of this, we can point to another figure in the Elberfeld book, labelled as a “Hanoverian hussar”, which, despite some obvious discrepancies of detail, is a close relative to Suhr’s image. 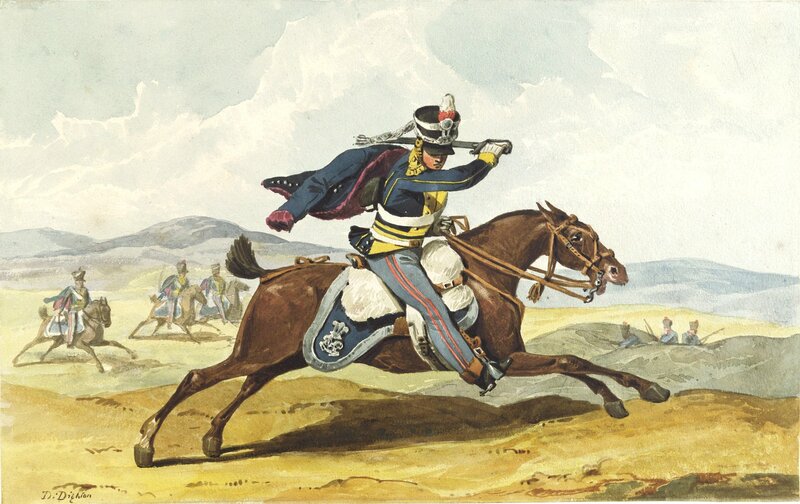 Since Elberfeld already contains an identified Estorff Hussar, as seen above, this one can only be intended as the 3rd Hussars. (Again, the version here is that re-drawn by Bueno.) 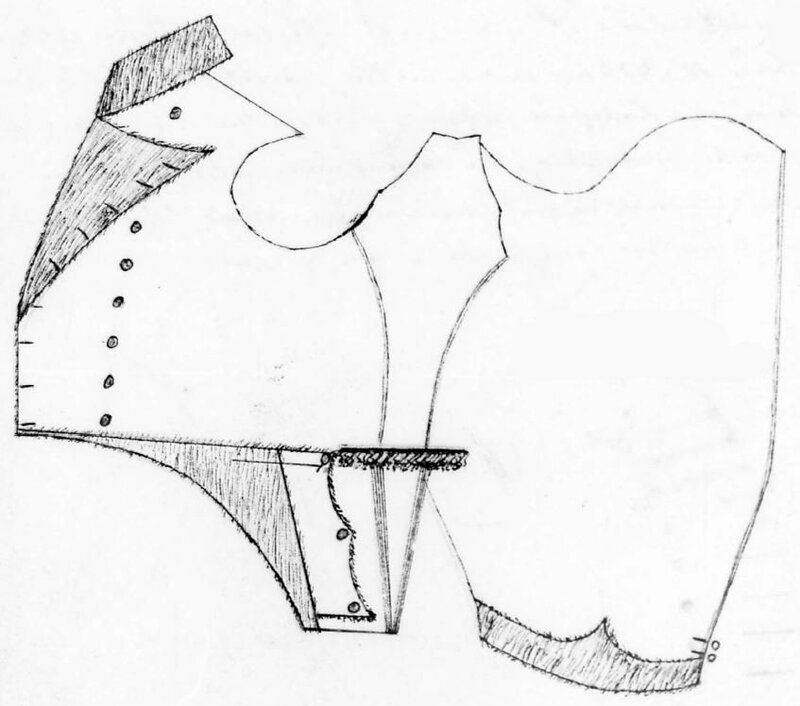 The date of the original sketch, January 1816, would have been a month before the Third was disbanded. 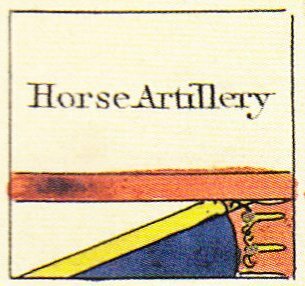 So, I think both blue “Estorffs” – Suhr and Neumann – should be properly understood as records of the 3rd Hussars of the KGL, like their Elberfeld cousin; and on that basis the trio will be added in due course to my page on that regiment, though Neumann’s version, as a much later synthesis from conflicting sources, has to be considered the most artificial and the least valuable of the three. 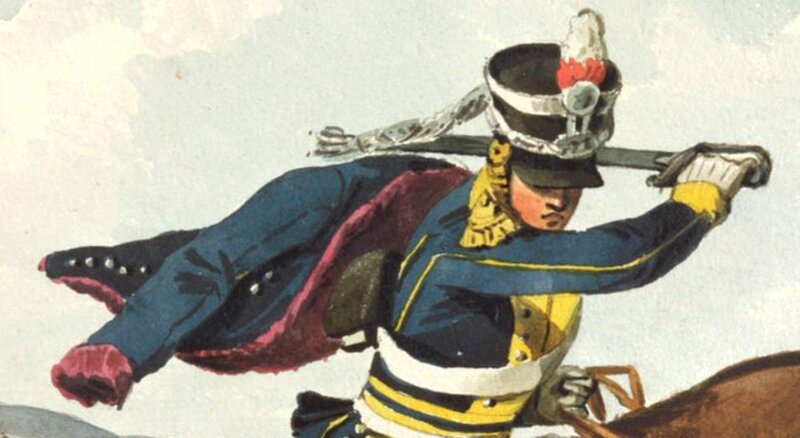 My KGL cavalry pages have seen some fairly extensive revision, correction and expansion lately – particularly those for the Hussar regiments and the Light Dragoons of 1813, which, though I say it myself, are now looking fairly comprehensive. Or as comprehensive as the evidence allows. If more information arrives, it will be added. The menu for these pages is in the sidebar to your right, or up the top and drop down.